Consortium partners hand over Memorandum of Understanding to Federal Minister Anja Karliczek on 23 January 2019. DALLAS and YVERDON LES BAINS, Switzerland, 24 January 2019: Leclanché SA (SIX: LECN), one of the world’s leading energy storage solutions companies, today announced that it is to participate in the industrial consortium which will support and operate a Battery Cell Research Production Centre, a new research and large-scale industrial manufacturing plant for lithium-ion cells, based in Germany. 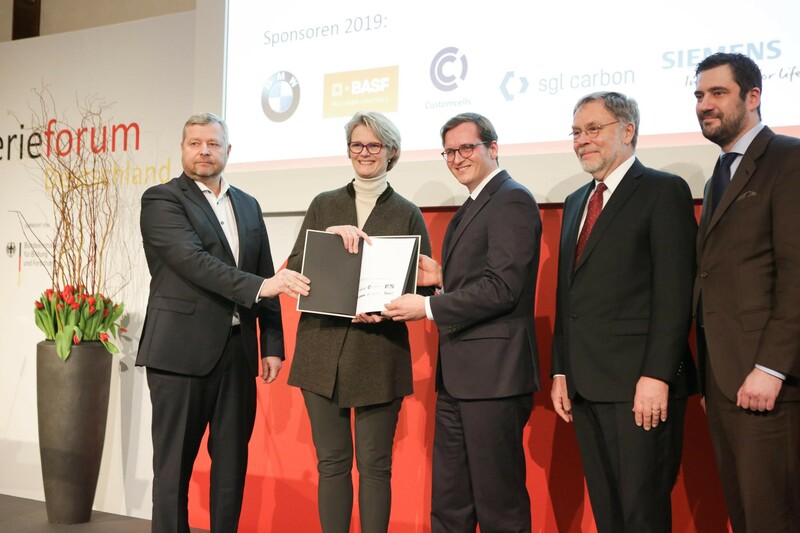 The project is a significant win for the German Ministry of Education and Research, Germany, and for Europe at large who need the participation of leading lithium-ion players to build a European-based industry capable of minimising dependence on Asian battery manufacturers. The BMZ Group is a global player in the production of lithium ion system solutions. The group is headquartered in Germany and has production facilities in China, Poland and the USA as well as subsidiaries in Japan and France. In addition, there are research and development locations worldwide. Around 3,000 employees work for the BMZ Group worldwide. Customcells is a worldwide operating high-tech company with approx. 40 employees. We develop and produce battery electrodes, lithium-ion battery cells and energy storage systems under the slogan "Special applications are our standard". More than 450 customers in more than thirty countries rely on Customcell's technology, which includes renowned technology leaders in electromobility and other industries (e.g. oil and gas industry, chemical industry and industry-related research institutes). Our company sees itself as a first movers in the megatrend "energy storage". Technology development, cell design and production are carried out on a small and medium scale. Customcells is growing strongly with production facilities in Schleswig-Holstein and expansion plans in southern Germany. EAS Batteries GmbH has been producing large-format lithium-ion cells and lithium-ion batteries at its Nordhausen site for more than 20 years with approx. 40 employees. The EAS technology is characterized by above-average power densities and is mainly used in hybrid electrical applications. The high safety and performance of the EAS systems are particularly sought after in the fields of shipping, construction machinery, rail vehicles and mining vehicles as well as in the aerospace industry. Since 2017, EAS Batteries has been part of the MONBAT Group, the third largest battery manufacturer in the world. Liacon GmbH is currently setting up a lithium-ion cell production facility near Dresden, in Ottendorf-Okrilla, with a production capacity of up to 300 MWh per year. Production will start in the first half of 2019. In addition, the company maintains a research and development group in Itzehoe. The company currently employs approximately 40 people at both sites. Headquartered in Switzerland, Leclanché SA is a leading provider of high quality energy storage solutions designed to accelerate our progress towards a clean energy future. Leclanché’s history and heritage is rooted in over 100 years of battery and energy storage innovation and the Company is a trusted provider of energy storage solutions globally. This coupled with the Company’s culture of German engineering and Swiss precision and quality, continues to make Leclanché the partner of choice for both disruptors, established companies and governments who are pioneering positive changes in how energy is produced, distributed and consumed around the world. The energy transition is being driven primarily by changes in the management of our electricity networks and the electrification of transport, and these two end markets form the backbone of our strategy and business model. Leclanché is at the heart of the convergence of the electrification of transport and the changes in the distribution network. Leclanché is the only listed pure play energy storage company in the world, organised along three business units: stationary storage solutions, etransport solutions and specialty batteries systems. Leclanché is listed on the Swiss Stock Exchange (SIX: LECN).